The installation includes a yellow awning with faded English and Chinese characters in red and a grocery cart with a black plastic bag tied to it. A Manhattan art gallery done up to resemble a rundown Chinatown business is angering some in the community who see it as racist and offensive. The controversy centers on the James Cohan Gallery on the Lower East Side, not far from Chinatown. Omer Fast, a Berlin-based artist, redid the inside and facade to resemble “what they were like before gentrification,” according to a press release on the gallery’s website. That includes a yellow awning with faded English and Chinese characters in red, folding chairs arranged on a scuffed-up floor with mismatched linoleum tiles, red lanterns hanging from the ceiling, and a grocery cart with a black plastic bag tied to it. “In that creation, he chose visual signifiers that involved making purposeful holes and dents in the wall, broken furniture, broken ATMs, graffiti, and a place of general filth,” Liz Moy, core member of the Chinatown Art Brigade, which protested at the space this past weekend, told NBC News. “That is something that has been used to characterize Chinatown throughout its history as a way to keep it from getting resources,” she added. The James Cohan Gallery, in a statement to NBC News, defended Fast’s remodeling for his exhibition, which features a 15-minute, 3D digital fictional film entitled “August.” The film is inspired by the life and work of August Sander, a famous German portrait photographer in the early 20th century. Fast also released a nearly 500-word statement Wednesday, which was posted on the James Cohan Gallery website. The gallery said Fast was unavailable for comment beyond the statement. On Sunday, a group of at least 50 artists, activists, and community residents protested at the Grand Street gallery, according to Moy. Inside, Moy said they read aloud a letter, calling for the exhibition to be shut down. A copy, posted on the Chinatown Art Brigade website, was also emailed to the James Cohan Gallery with no response, Moy said. The Lower East Side has a long and storied history as an immigrant neighborhood, once known for its crowded tenement houses. But the last decade-or-so has seen it transform into a hip destination with trendy bars, restaurants, boutique shops, and art galleries. 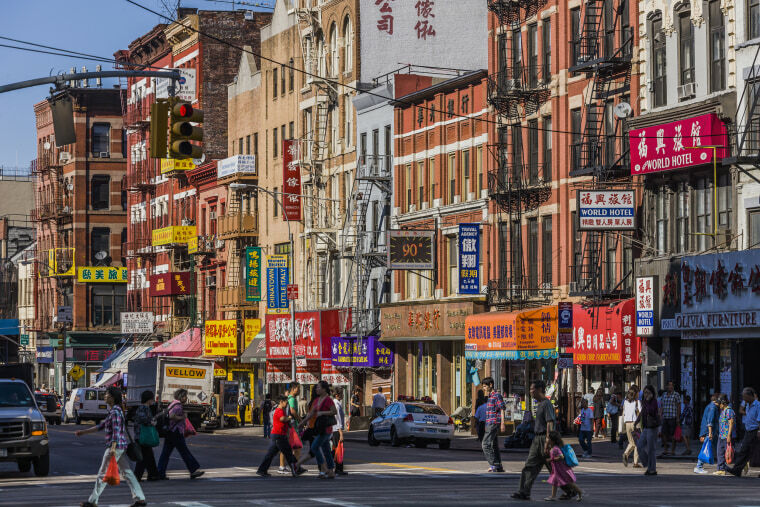 Around 1 in 4 Lower East Side residents is Asian, most of them Chinese, according to Census figures tabulated by the NYC Department of City Planning. As rental prices soar and million-dollar condos get built, community activists worry that longtime residents and mom-and-pop shop owners, immigrant among them, are being priced out of the area. “That was the point of our action, to point to the larger changes,” Moy said. Meanwhile, the James Cohan Gallery stood by Fast’s exhibition, which is expected to run until Oct. 29. “People are free to draw their own conclusions about art, but they should also be given the opportunity to do so — without censorship, barriers or intimidation,” its statement reads.